Located in Las Vegas (Las Vegas Strip), Flamingo Las Vegas - Hotel & Casino is a 3-minute walk from LINQ Promenade and 8 minutes by foot from High Roller. This casino resort is 0.9 mi (1.4 km) from Miracle Mile Shops and 1.9 mi (3.1 km) from Las Vegas Convention Center. Make yourself at home in one of the 3460 air-conditioned rooms featuring flat-screen televisions. Wireless Internet access (surcharge) is available to keep you connected. Private bathrooms with showers feature complimentary toiletries and hair dryers. Conveniences include phones, as well as safes and desks. Relax at the full-service spa, where you can enjoy massages and facials. Before a night out at the casino, the 2 outdoor swimming pools are a perfect way to relax and recharge. Additional features at this resort include complimentary wireless Internet access, gift shops/newsstands, and a hair salon. Grab a bite at Paradise Garden Buffet, one of the resort's 5 restaurants, or stay in and take advantage of the room service (during limited hours). Snacks are also available at the 2 coffee shops/cafés. Wind down with a drink at one of the 5 bars/lounges or 2 poolside bars. Cooked-to-order breakfasts are available daily from 6 AM to 10 AM for a fee. This Las Vegas hotel is located on the famed Strip, a mile (1.6 kilometers) from Fashion Show Mall. Valet and self parking (surcharge) are available, and the resort fee includes Internet access for 2 devices. The on-site spa includes men's and women's relaxation lounges with plasma TVs; wet and dry saunas; steam rooms; and hot, warm, and cool spa tubs. Use of spa facilities is available for a daily charge or is complimentary with a treatment. The 80-foot (24-meter), family friendly Beach Club Pool is surrounded by rental cabanas and huge flamingo statues. Guests 21 years or older looking for a livelier atmosphere can attend the GO pool, which features a swim-in grotto behind a triple waterfall. Live DJs perform at the GO pool daily. Set in a terraced garden with ponds, streams, and waterfalls, the hotel's Wildlife Habitat is home to exotic ducks, cranes, and Chilean flamingos. Admission is complimentary. Jimmy Buffet's Margaritaville - Casual multi-level outpost of Caribbean-themed international chain. Five bars, dining room, and patios overlooking the Strip. Open for lunch and dinner, late-night dining. Live entertainment nightly. Paradise Garden Buffet - Breakfast, lunch, and dinner buffets daily. On Fridays and Saturdays there will be a seafood buffet. Carlos ‘n Charlie’s - Casual Mexican restaurant with a menu of tacos, burritos, and margaritas. An expansive patio overlooks the Flamingo’s pool area. Patio Bar - Located near the hotel's guest entrance. Features three plasma TVs and is adjacent to the property's 15-acre pool complex. Open afternoon until late night. Beach Club - Serving light snacks, lunch, and frozen drinks by the pool. Open during summer months. Center Cut - a Las Vegas steakhouse that houses a large bar and lounge area offering a robust selection of specialty martinis in addition to classic cocktails, mixed drinks, and wines by the glass. Club Cappuccino - Enjoy an array of premium coffee both hot and frozen, espresso, cappuccino, mochas, lattes, tea, and smoothies that are perfectly paired with a bag of fresh melt-in-your-mouth mini donuts. The "X" Burlesque adults-only show is housed in the intimate 180-seat Flamingo Cabaret, allowing audiences to get up close and personal with the 6 beautiful and talented female dancers. The Flamingo Las Vegas - Hotel & Casino's 77,000-square-foot (7,154-square-meter) casino includes a poker room and a race-and-sports book. Legends in Concert – Legends In Concert is known as the pioneer of live tribute shows. Legends in Concert is a one-of-a-kind concert experience with each performer singing with their own natural voices and backed by a live rockin' band and an incredible supporting cast of singers and dancers. Donny and Marie - The brother-sister duo has been performing their stage spectacular, Donny & Marie, since 2008. Their timeless roster of material is captured in this homage, showing off both their well-known pop duets and covers as well as solo numbers. Piff the Magic Dragon - Piff and Mr. Piffles perform their unique twist on the traditional magic show following their first North American tour. Enjoy this critically acclaimed magic show, filled with comedy and the World's Only Magic Performing Chihuahua. 2 pool areas, a children's pool, and a freeform spa tub are set in a 15-acre garden. The heated, 80-foot-long, family friendly Beach Club Pool is surrounded by huge flamingo statues on pedestals and rental cabanas furnished with phones, TVs, and ceiling fans. A 150-foot water slide leads to 3 terraced pools connected by short water slides. A sprawling lagoon pool, featuring a swim-in grotto behind a triple waterfall, completes the complex. Harrah's Rio Secco Golf Club, 14 miles from the hotel, offers preferential tee times to Flamingo guests. The18-hole championship course is set among the foothills of the Black Mountains. Equipment rentals and the Butch Harmon Golf School are available at the golf club. For a sizzling summer scene, Flamingo GO Pool offers guests 21 years or older a high-energy, non-stop pool party. Surrounded by a beautiful 15-acre tropical retreat, the two stunning pools at Flamingo interconnect through lagoons and around a magnificent cascading waterfall. Margaritaville Casino - Discover the laid-back vibe of the islands amidst the high-energy Las Vegas Strip at this casino and bar inside the Flamingo Las Vegas - Hotel & Casino. 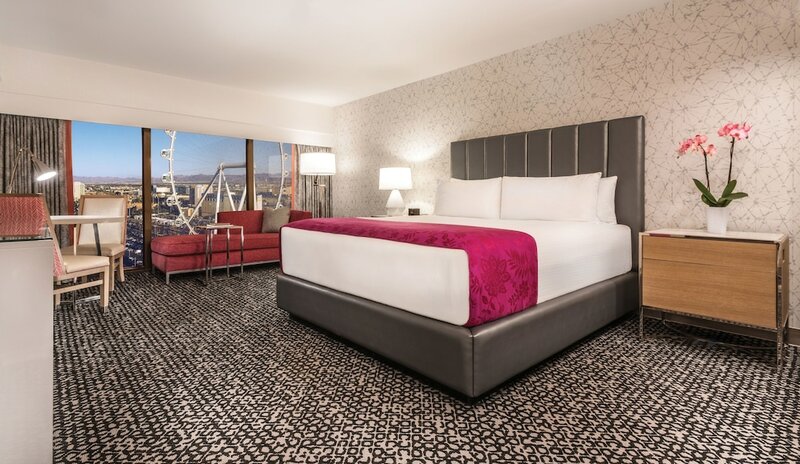 The Flamingo Las Vegas - Hotel & Casino is connected to the LINQ Promenade, an open-air retail, dining and entertainment district, anchored by the world's tallest observation wheel, known as the High Roller. Located at the heart of the world-famous Las Vegas Strip, the LINQ Promenade includes more than 30 unique retail, dining and entertainment experiences. Cribs (infant beds) are available for USD 30.0 per day. This property caters to gay and/or lesbian guests. The property has connecting/adjoining rooms, which are subject to availability and can be requested by contacting the property using the number on the booking confirmation.